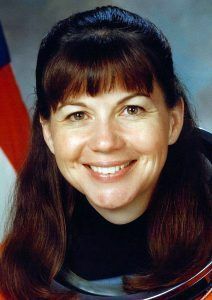 American materials scientist mission specialist astronaut 1992-2015. US Air Force engineer. Status: Inactive; active 1992-2015. Born: 1960-12-14. Spaceflights: 3 . Total time in space: 180.17 days. Birth Place: Charleston, South Carolina. Family: Astronaut. Country: USA. Flights: STS-73, STS-83, STS-93, STS-128 ISS EO-20, Soyuz TMA-19, Soyuz TMA-20. Projects: STS. Agency: USAF. Bibliography: 12, 5276. 1960 December 14 - . Birth of Dr Catherine Grace 'Cady' Coleman - . Nation: USA. Related Persons: Coleman, Catherine. American materials scientist mission specialist astronaut 1992-2015. US Air Force engineer. 3 spaceflights, 180.2 days in space..